Like the buds bursting from their dark winter burrows and into the spring sunshine, Starbucks’s newest tumblers are the colorful sign of changing seasons we seriously needed. The coffee chain delivered an extra treat to cap off our Easter candy high, releasing three new tumbler designs. And the pastel patterns, now available on Starbucks shelves across the country, are a millennial pink dream come true. AND THANK YOU, STARBUCKS, FOR MAKING OUR MILLENNIAL PINK DREAM COME TRUE! Why yes, we have had a lot of caffeine today, thank you very much — because #Mondays. 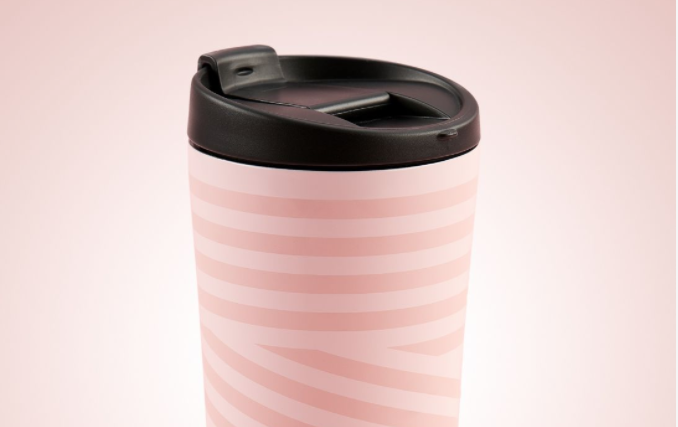 But back to the exciting, new products: You can deliver your caffeine fix via your choice of an opaque pink-striped cup, a clear plastic sipper circled with pink squiggles, or a floral travel mug. Availability may vary depending on where you’re shopping, but all three designs should be available everywhere (except online, unfortunately, but, c’mon, you’re going to be at Starbucks anyway, right?). This collection is hardly the only fresh thing ~the Bux~ is rolling out for spring. There’s the twinkly Crystal Ball Frappuccino, of course. Or, if you want to fully commit to the millennial pink movement (and you have funds on hand to, you know, fly to Japan), you could always order a new MILLENNIAL PINK LATTE *in* your MILLENNIAL PINK TUMBLER. Mind. Blown. Slightly sweeter than the flashier rose gold products that have been crowding your feeds all winter long (like Starbucks’s last must-have collection from November), this hue could have real spring and summer staying power. And it seems the pink party isn’t limited to the States. No, no, no. Far from it. In Japan and elsewhere in Asia, Starbucks fans have been freaking out over the past few days over their own spring collection of cups decked out in rosy cherry blossoms. Honestly, it’s all almost too much pretty to handle. Almost.